Over the weekend, I played once again the first computer game I played as a kid. 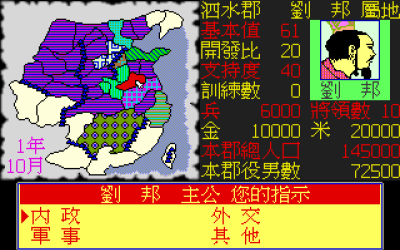 It was an 1990 game based on a period of Chinese history known as the Chu-Han Contention (楚漢之爭). 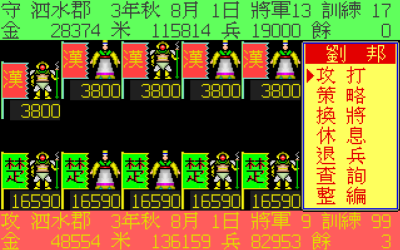 After the Qin (秦) Dynasty met its demise, China was broken into Eighteen Kingdoms. 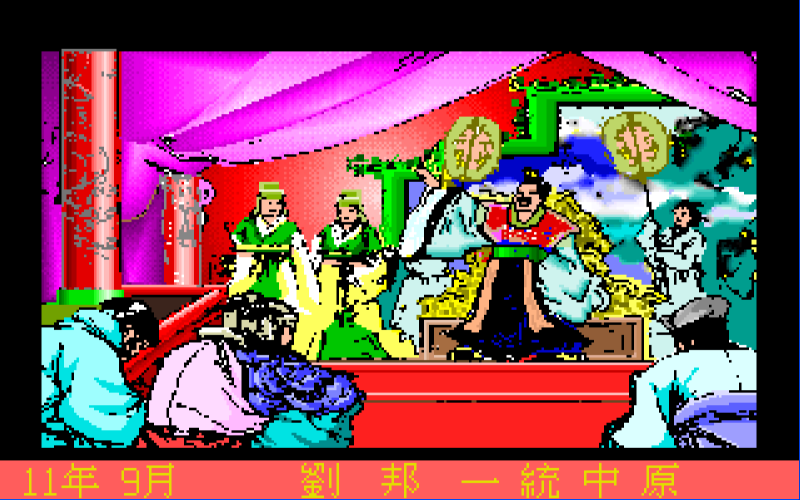 The two strongest kingdom were Chu (楚) and Han (漢), and Han eventually defeated Chu and unified China to create the Han Dynasty. This took place around year 240 B.C. and became my favorite period of Chinese history to read about. 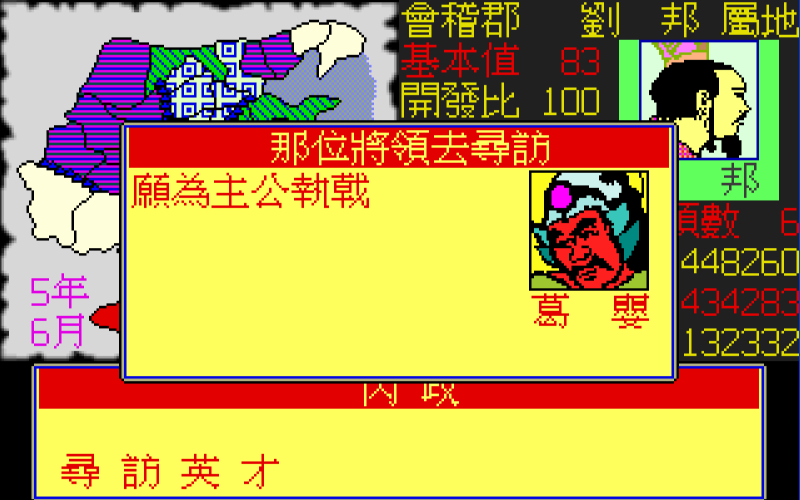 The game was not considered great, but back in 1990, there simply weren’t that many Chinese language games available in Taiwan. Let’s look at a few screen shots. This is the main screen. You can see the map, and all the other information like how developed your land is, how much gold you have, how much rice you have, and how many soliders you have. 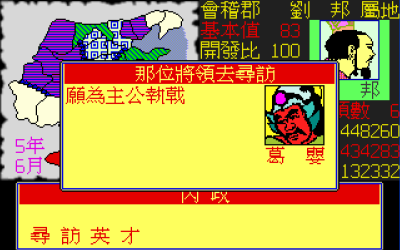 At the bottom of the screen is the menu that allows you to do different things like drafting civilians into the army, developing the land, and waging wars. Of course, you can’t do everything yourself. It’s time to find people to work for you! In the following picture, this person says 願為主公執戟, which literally translates to “I am willing to hold the halberd for my master”. Basically it’s a quasi-classic-Chinese way of saying “I agree to serve as a general for you”. How very exciting. And it’s time for the battle! 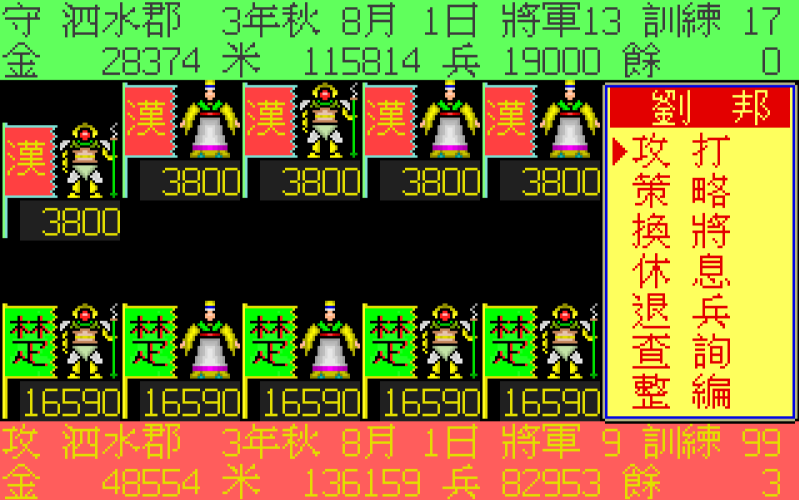 Each side is allowed to send five generals to the frontline (kinda like basketball). They each can bring take 30000 soliders with them. Kinda arbitrary, but whatever, it’s an old game. You attack one another by standing in place waving your weapon and flapping your arms in the air. Hooray! And after you win the battle, you see this picture. Look how happy the soliders are! Big grins and everything. 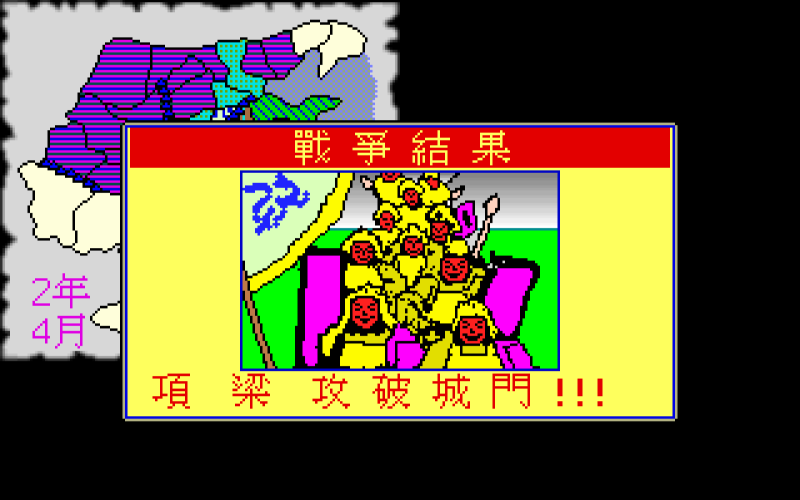 And finally, you defeat everybody else and see this picture that says you’ve unified China. Um, yay? It took me around two hours to beat the game this time. No, it was not the kind of game that you can play for months. After all, it was originally sold on two 5 1/4 inch floppy disks, so the entire game is smaller than one mp3 file these days. My hard drive back them held 40MB of data, where as a smart phone nowadays can easily hold hundreds times more. Time sure has changed. But hey, it’s nostalgia. And actually, it’s pretty entertaining just to play and see what you can get away with, since the artificial intelligence simply wasn’t all that smart for a military strategy game like this. It’s really not about whether I will win, but how I won it. The most ridiculous way of winning was actually how I beat the game for the first time. Basically, I just spent all my time looking for new generals to join my army. And then I used the “skip to end of year” feature over and over. After some number of years, all these game characters started to die of old age. And when a King died, a new King was chosen among his generals. But of course, if all the generals died too, there was nobody to be the King and the kingdom ceased to exist. Well, that’s what happened to everyone else. Since artificial intelligence was not smart enough to notice this problem, I was the only one who kept looking for new generals that were not old enough to die yet. 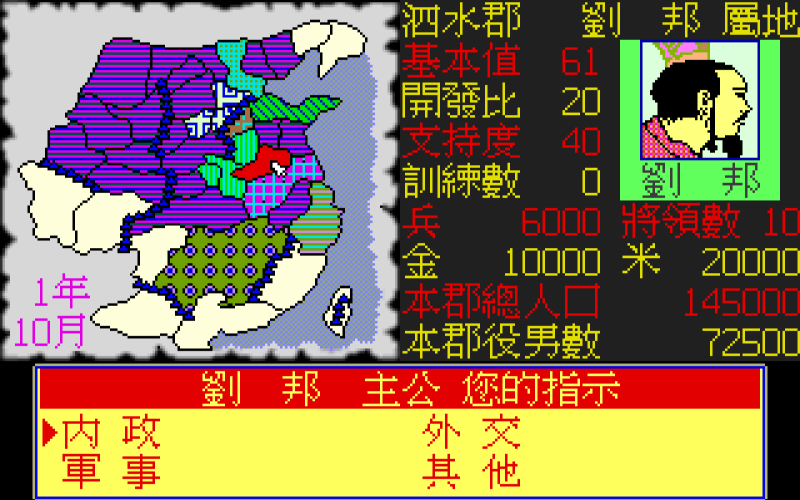 Eventually, every other kingdom died out and I unified China without waging any war. That was dumb, but it was an amusing way to win. This must have been a clear indication of your future — to figure out the glitch in this program! 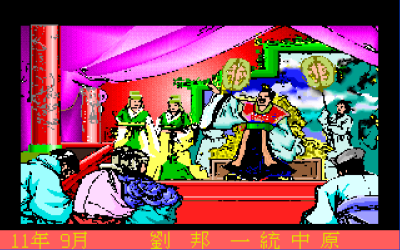 Hooray for games that can only display 256 colors! Actually, all these old games have something in common. Before you start the game, they ask you which kind of monitor you have. There were three kinds and they all displayed different sets of colors, so you need to pick the right one or the colors look all wrong. That is so cool. I remember those days — Sky used to play the educational ones. Actually, though, we never had the ones on the floppies. The graphics actually seem pretty good for those early days. I played an educational one where you have to do some basic arithmetics fast. There are people trapped in a fire in tall buildings. As time progresses, the fire will get bigger and bigger. And you need to do math faster and faster so the fireman’s ladder can get taller and taller. I still remember the music. I doubt that I can find a copy of that though. Haha, love it! As long as the kid is altruistic, they’ll learn how to do math very quickly! I’d love to see that one online. I doubt very many people played the Mac version though – it seems the original is far more loved by nostalgia gamers as I discovered looking for a link.